The machine is totally made of the food grade stainless steel with its base all of whole natural granite of hardest type. 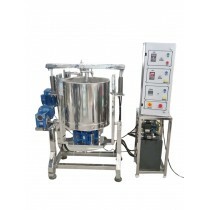 The Drum rotation can be controlled by speed controller and having manual inclination of the turning module. Electra Cocoa Grinder (Chocolate Melangeur) is available in various capacities like 11Lbs, 20Lbs, 30Lbs, 40Lbs, 65Lbs, 100Lbs, 150 Lbs and 200Lbs.